Looking at both pics, the flatbow bowarm is bent, the longbow one is straight. With the heavy longbow, holding the weight on a bent arm would be more difficult and I think that is why you have ended up with it straight. On the lighter flat bow you can get away with the bent elbow. That is why it looks lower, but I don't think that is a good thing. When we do press ups, we bend the elbows to get our chest to the ground. Coming back up the elbows straighten a bit. IF we are coming up and want to stop for a rest, with the chest well up from the floor, we adopt a straight elbow and let our weight be held by the bones. Try stopping in the half way down position to see how difficult that is. Your hand position is different on the different bows, partly because the shape of the bow grips are different. BUT the bent elbow on the flatbow also adds to the change in hand position, specially at the wrist. IF you adopted a straight bow arm with both bows ,you would see how alike the two pictures become. Hi geoffretired, thanks for the comment. My arms is actually bent in both pictures. In the longbow picture my elbow is just turned upward toward the ceiling while with the flatbow it is pointed more towards the ground. I think the longbow position creates more bone alignment. That is, as long as I'm looking at this picture correctly. 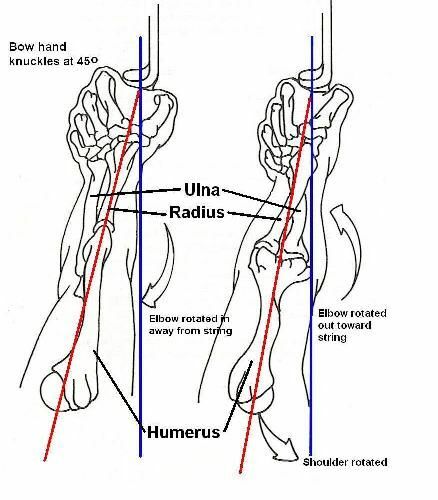 The easy way to sort out the bow elbow angle is to find out what happens when you bend the elbow. If , when you bend the elbow, the hand moves across from side to side, then all is well. If the hand moves up annd down, the elbow is rotated the wrong way.. If you have your arm out straight, as if holding your bow at arm's length, then try to move the forearm side to side, the elbow is well sorted Try the arm out straight while moving the hand up and down and it will be 90 degrees out of position.. There is no doubt when doing this. It is proof without grey hairs wondering if......you are looking at things from the right point of view.